The demeanour was no less hangdog, but Slaven Bilic�s words were upbeat at last as he was able to celebrate a rare home Premier League victory. Mark Noble�s first-half goal, tucking away the rebound of his own saved penalty, earned West Ham three points in an unremarkable but unrelenting encounter with Burnley in which the home side dominated the first half only for the visitors to spring back in the second. His summary was spot on. West Ham recorded 72% possession in the first half but, even with Andy Carroll restored to the starting lineup, failed to open up a resolute Burnley backline. That was not necessarily a disaster for a team with West Ham�s skill set, however, so well stocked are they with long-range shooters, and both Pedro Obiang and Noble duly hit the woodwork from distance before half-time. The goal came in injury time in the first half and from a Dimitri Payet corner, after the Frenchman, who lasted the full 90 mintues, found Carroll with his cross. The forward�s header went straight towards Tom Heaton, but the Burnley keeper seemed to be impeded by Michail Antonio and could not get to the ball. Instead it bounced back into the path of Winston Reid and, unwilling to give him a shooting opportunity, Ben Mee pulled the New Zealander to the ground. 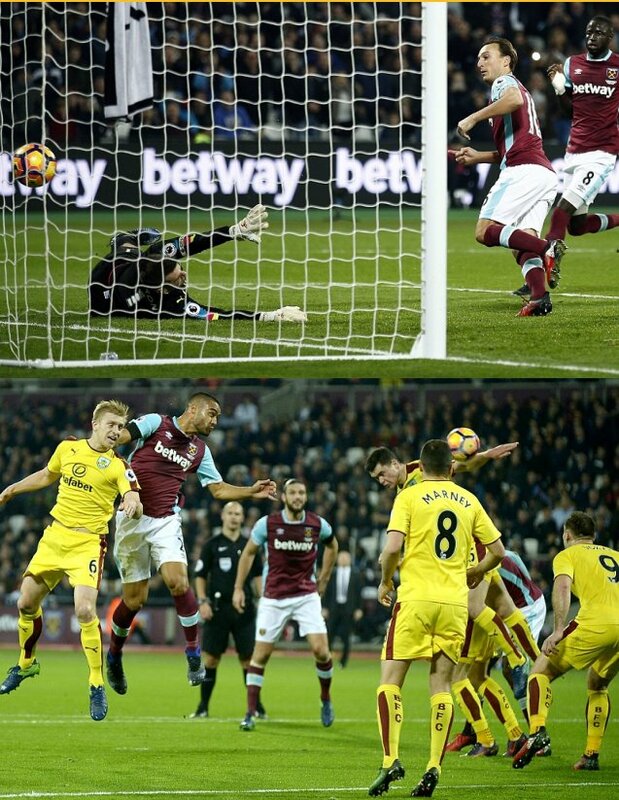 The referee, Robert Madley, awarded the penalty and Noble turned it in at the second attempt after his first was well saved by Heaton. For Sean Dyche it was a goal that should never have been given. �It was a clear foul on Tom Heaton,� said the Burnley manager of Antonio�s block. After a digression into the history of challenges on goalkeepers � �It�s not 1972 any more, not that I�m old enough to remember that� � Dyche went on to praise his side for their second-half improvement and declared himself disappointed not to be leaving with a point. Next up for Burnley are Spurs at White Hart Lane on Sunday. West Ham, meanwhile, welcome Hull City to the London Stadium and, after Wednesday night, the chance to secure back-to-back wins. But after speaking last week of his side�s need for a �clean sheet mentality�, Bilic believes his team must also shake off the mental �cramp� that afflicted them in the second half here. West Ham (4-3-3): Randolph 8; Kouyate 6, Reid 7, Ogbonna 6, Cresswell 6; Antonio 6.5, Noble 7.5 (Nordtveit 88), Obiang 6; Lanzini 6 (Ayew 68 6), Carroll 6.5 (Fletcher 82), Payet 6. Subs not used: Adrian, Fernandes, Quina, Browne. Burnley (4-4-2): Heaton 6.5; Lowton 6, Keane 6, Mee 5, Ward 6; Arfield 6 (Bamford 90), Marney 6, Hendrick 6, Boyd 6 (Barnes 76); Vokes 6, Gray 6. Subs not used: Flanagan, Kightly, Defour, Robinson, Tarkowski.